In medium bowl, combine chicken, onion pieces, tomato, avocado and eggs; toss gently to mix. In small bowl, combine vinegar, oil, sugar, salt, pepper and mustard; mix well. Add to chicken mixture; toss to coat. Spoon chicken mixture evenly down center of each tortilla. Top each with spinach and cheese. Fold up bottom edge of each tortilla; fold in sides. Cobb salad originated at the Brown Derby Restaurant in Hollywood. In the classic recipe, chicken, hard-cooked egg, tomato, avocado and watercress are chopped and dressed with blue cheese vinaigrette. 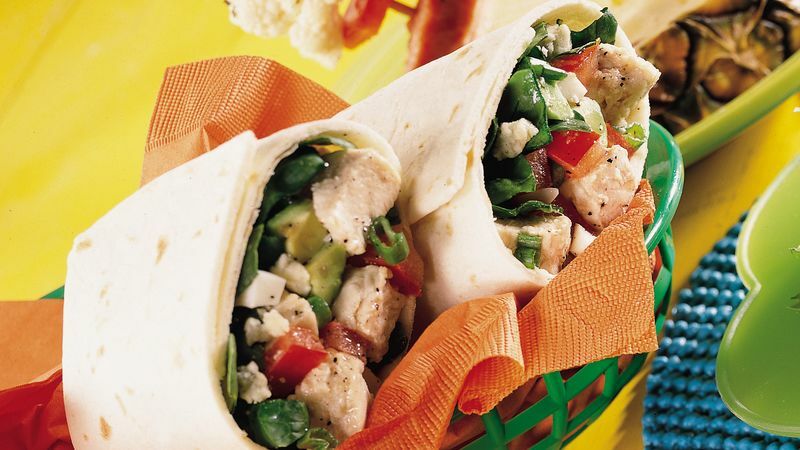 Spinach takes the place of watercress in our salad-wrap version. Save time by purchasing hard-cooked eggs, available in our supermarket deli or dairy case. To hard-cook eggs, place them in a small saucepan; cover with cold water. Bring to a boil. Reduce heat; simmer about 15 minutes. Drain immediately; run cold water over the eggs to stop the cooking process.